I generally appreciate Daniel Wallace’s Grammar. Granted, I think he uses way too many categories that have very little to do with actual Greek grammar and everything to do with “literal” translation, but all in all, he provides quite a bit of information in an accessible manner. His section on the Greek article is fantastic. And it should be considering that he wrote his dissertation on this particular part-of-speech. And yet, in spite of that, I cannot, for the life of me, understand the reasoning behind this following statement. It drives me crazy every time I see it. One of the greatest gifts bequeathed by the Greeks to Western civilization was the article. European intellectual life was profoundly impacted by this gift of clarity. Daniel B. Wallace, Greek Grammar Beyond the Basics: An Exegetical Syntax of the New Testament (Grand Rapids, Mich.: Zondervan, 1996), 207. See P. Chantraine, “Le grec et la structure les langues modernes de l’occident,” Travaux du cercle linguistique de Copenhague 11 (1957) 20-21. And it’s a reference to an article that I neither have access to or could even read. But even still, I cannot accept it. Perhaps Latin didn’t have an article—definite or otherwise—the way that Greek does. Yet that does not mean that the Greek article is remotely related to the article we find in the either the Roman languages (e.g. Spanish, Italian, French…) or the Germanic Languages (English, German, Dutch, Norwegian…). If anything, the articles in Germanic languages are derived from Germanic demonstratives derived from Proto Indo-European. the, dem. a. (def. article) and pron. [The reduced and flexionless stem of the OE. demonstrative se, séo (later e, éo), æt, the neuter sing. of which has come down as the dem. pron. and adj. THAT. Com. Teut. and Indo-Eur. : = OFris. thi, thiu, thet, OS. (se), th(i)e, thiu (the), that (the), (MLG., MDu. de (die), dat, LG., Du. de, dat), OHG. der (de), diu, daz (mod.Ger. der, die, das), ON. sá, sú, at, Goth. sa, sô, ata, also Gr. , , , Zend ho, h , tat, Skr. sa, s , tat; all the inflexional parts exc. the nom. sing. m. and f. having the stem a-, Lith., Slav. to-, Gr. -, Zend, Skr. ta-, Indo-Eur. to-, found also in L. in tam, tum, tunc, is-te, is-tud, etc. The nom. sing. m. and f. in OTeut., as in Skr., Zend, Gr., belong to another demonst. stem sa-, I.-Eur. so-, found also in Ir., Gael., Gaulish so this, L. -se in ip-se. But in OHG., OS. (in most dialects), and in late OE. (10th c. in Northumbrian, and at length everywhere) the s- forms were superseded by forms in – (OHG. d-), from the same stem as the neuter æt and the oblique cases, as well as the pl. á, later , THO. After the middle of the 13th c. the s- forms are no longer found, exc. as a belated survival (ze m., zy f.) in the Kentish dial. of the Ayenbite (1340). The only surviving reprs. of the OE. forms are the and that, Du. and LG. de, dat; but while LG. dat (besides its other uses) is still the neuter article, the Eng. that has ceased to be any part of the article. Not to mention that fact that Greek, Romance, and Germanic languages are different branches of the Indo-European Family (<—very cool website). More importantly, there’s another issue here. Even if the article of every Modern IE language was derived from Greek, there would still be no basis for Wallace’s statement. Wallace’s statement would appear to suggest that without the article, we would all really struggle to talk about anything definite. We wouldn’t be able to talk about people, places, things, or events as specific or identifiable (the two proto-typical features of definiteness, though the Greek article only expresses the latter, I would argue). And as a result our Western Civilization would suffer. But this is plainly not the case. There are plenty of languages all over the world (and in Europe, I might add) that do not have any sort of article at all and get by just fine. The Map above shows languages and the status of the definite article as a part-of-speech. Its borrowed from WALS Online (specific map HERE). 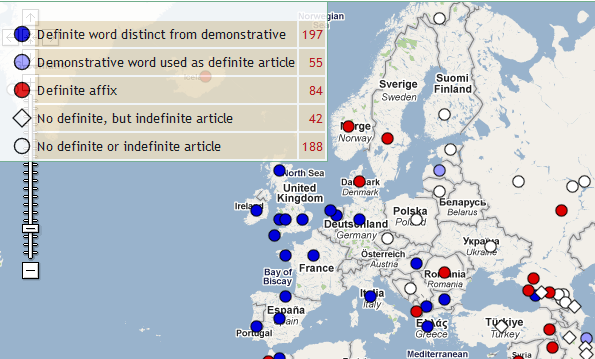 Of 566 languages represented in the WALS database, 188 of them have no sort of article at all. Fundamentally, there is no reason why a language that lacks any kind of article should have any influence on a language’s ability to express such “subtle” semantics as definiteness. Again, I should emphasize that I use and appreciate Wallace’s grammar. It simply shouldn’t contain statements like this particular. Sentences like this detract from its quality, damage its reputation, and mislead students who are easily impressed by extravagant statements. They move us into the realm of “Greek is the most graceful and perfect of languages with the most beautiful organization…blah…blah…blah.” No, we don’t need any more that. “For a discussion of the history of proto-Greek (esp. Linear B which was identified as proto-Greek in 1952), see Palmer, The Greek Language, 27-56. The inscriptionary evidence does not reveal different dialects until as the 12th century BCE.” (ft. 3, p 14). I’m also a little weary of what he means when he states that Sanskrit is the “older sister” of Greek and Latin. I’m pretty sure that the dialectal situation is far more complicated than that too. Chadwick argues that Mycenaean Greek must be considered a separate dialect, not a parent of the Classical dialects. Well, at least not of all the Classical dialects, but there is significant debate about the relationship of Mycenaean to any potential/hypothesized daughter dialects. Thanks, Mike, for pointing this out. More importantly, I think that what we see here is a reflection of a (widespread) misunderstanding of how language works, namely, a confusion between the formal properties of a language and what the language expresses. Here we see the claim that a definite article translates directly into definiteness of reference. (I think the claim is wrong factually and theoretically.) In other, similar cases, we find people (wrongly) equating, for example, passive verbs with passivity, reflexive verbs with reflexivity, or masculine words with masculine reference. I think that these sorts of errors have led to considerable confusion. Yes, its a perfect example of a place where the Strong version of the Sapir-Whorf Hypothesis just doesn’t do just to what actually happens in language. I’m convinced by your post (‘How could Greek have bequeathed the article to English and friends?’ and ‘It’s not the article that makes definiteness possible.’) Still, it does raise the very interesting question whether we should consider all languages to be functionally equivalent, or whether certain structural features (like articles, plurals, forms that grammaticalize aspect, or whatever ) actually change not just the way languages express things, but actually make some difference in the kinds of things that language communities can (or can easily) speak about. They say that ‘the words we use for things impact how we think of them’–and not only the other way around. Is it also true that the linguistic structures we use have an impact on how and what we think? I can’t see why not. That said, my first exploration into such territory would be (just for fun) a paper defending the thesis that an explicit article brings with it all sorts of confusion which requires a great deal of energy to try to straighten out! When you move into the territory of whether different languages change how people think and influence the ability to talk about certain things, concepts, & events, you tread on dangerous ground. I must point you to this book: The Great Eskimo Vocabulary Hoax and Other Irreverent Essays on the Study of Language . So the NY Times just had an article that is pretty relevant to this discussion. It’s worth checking out. I’d like to hear your opinion on it: http://www.nytimes.com/2010/08/29/magazine/29language-t.html?pagewanted=1&_r=1&sq=language%20shape&st=cse&scp=1. That was an excellent article, though I confess that it makes me nervous when I read about gender like that because of what’s happened in biblical studies — it was be perfectly easy to talk about the interpretation of inanimate objects in Spanish and German which have native speakers to be tested. But that is not the case with Ancient Greek and many a non-Greek speaker has attempted to make claims about Greek gender without any idea of how Ancient Greek speakers would perceive the world. I DO have to wonder if Germans’ thought processes are influenced by the fact that verbs sometimes are at the very end of the sentence. I would think that would possibly instill some degree of patience or desire for orderliness. z.b. Alles muss in Ordnung sein.